Sowerby Music has been organising monthly professional concerts in St Oswald’s Church for 30 years. 21 years ago we realised that small rural schools in North Yorkshire have little access to professional music making and seldom have trained music teachers. Thus Music for Life was born. An attempt to share our enjoyment of music with the next generations. Music for Life has now grown and developed into the biggest and most diverse programme for young people organised and funded by any music society in the country. All credit for this success lies with the many committed and dedicated volunteer members of Sowerby Music. More information (1.1MB pdf leaflet). 6pac Trio I learnt that a drum in the drumkit has a lever that changes the sound. I really want a drumkit for my birthday. 6pac Trio It was very interesting when Andy opened up the piano and I saw all of the strings inside. 6pac Trio Thank you so much for teaching us so much about your instruments and how they worked. 6pac Trio I liked the music because it was really loud. Steve & Alex I loved the singing and playing ‘The Zoo Blues’. Steve & Alex I really liked learning the Italian words. I remember presto, lento, staccato. Steve & Alex It was fun when you came and I loved it when I had a go at conducting. Steve & Alex I liked hearing the bassoon because I have never heard it before. Music Explorers, tuba and French horn I enjoyed learning about the mute because I had never seen one before. Music Explorers, tuba and French horn The funniest part was when we got to play the animal horns. William was best and he’s only 4. Music Explorers, tuba and French horn The workshop was brilliant because I really liked doing the concert for the infants. People worked as a team. Music Explorers, tuba and French horn My favourite piece was the baby elephant walk. Music Explorers, tuba and French horn The tuba sounds as low as thunder and the French horn sounds softer. Music Explorers, tuba and French horn It has really inspired me to learn a brass instrument. Music Explorers, tuba and French horn Thank you for playing the tuba, French horn, teapot, white board, hosepipe and animal horn. Music Explorers, tuba and French horn I liked it when you buzzed through the mouthpiece when it was not on the instrument. Thank you for coming to Knayton School to play music for us. Our favourite bit was the song called ‘When the saints come marching in’. We enjoyed it when Matthew conducted the band and when Miss Chapman played the drums. It was great that some of us were able to join in. We thought Andy was very funny especially when he started to play the National Anthem after Ben played the drum roll. We learnt loads and had lots of fun. Sowerby Music generates the largest outreach music programme for schools in the country organised by a music society. 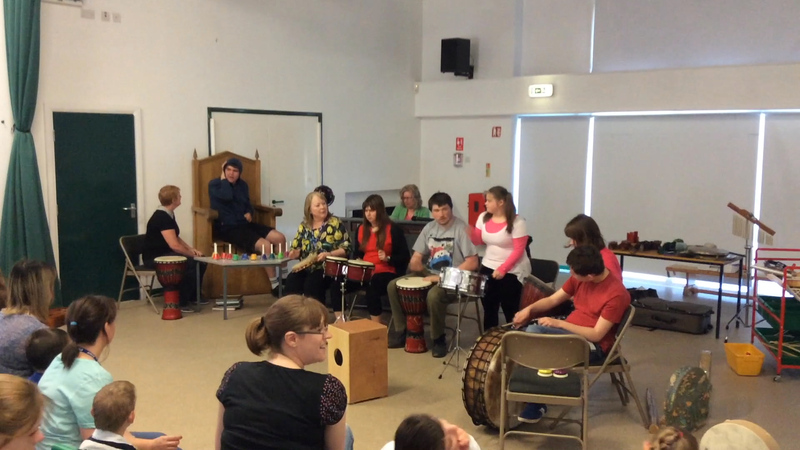 During 2019 approximately 3,300 children from the Hambleton District of North Yorkshire have been enthused by 9 groups of professional musicians performing concerts and running workshops in 29 schools. For more information contact Vicki Farby. I am writing to say many thanks for yet another wonderful visit from your musicians. The concert was very good and the workshop has given us a new school song! We always look forward to your visits as it gives our pupils a great opportunity to enjoy and participate in live music. We look forward to seeing you next year.